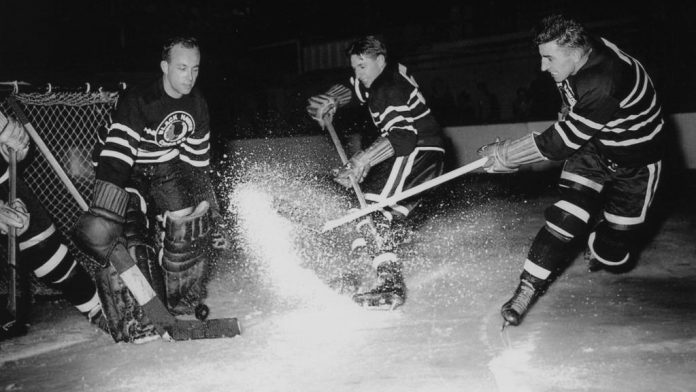 1947: The Bentley brothers are too much for the New York Rangers. Doug Bentley scores four goals and sets up two more, and brother Max Bentley scores three goals and assists on another to help the Chicago Blackhawks defeat the Rangers 9-7 at Madison Square Garden. Though Max Bentley is outscored by his brother for one night, he ends up leading the NHL in scoring with 72 points (29 goals. 43 assists). Doug Bentley finishes the season with 55 points (21 goals, 34 assists), ending up sixth in the scoring race. 1955: Doug Harvey of the Montreal Canadiens is credited with his 41st assist of the season, setting an NHL record for defensemen, in a 4-1 win against the Boston Bruins at the Forum. Harvey surpasses the mark of 40 set by Babe Pratt of the Toronto Maple Leafs in 1943-44 when he assists on Maurice Richard‘s goal at 13:15 of the first period. 1967: The Montreal Canadiens take some unusual transportation to Chicago Stadium for a game against the Blackhawks. When their chartered bus fails to show, the Canadiens travel to the game in a taxi, a police paddy wagon and a couple of police cruisers. The game ends in a 2-2 tie. 1984: Mario Gosselin of the Quebec Nordiques becomes the 16th goaltender to have a shutout in his first NHL game. He makes 26 saves in a 5-0 victory against the visiting St. Louis Blues. 1989: Mario Lemieux has three assists to become the third NHL player to have 100 in a season, joining Bobby Orr and Wayne Gretzky. Despite Lemieux’s three assists (and a goal), the Pittsburgh Penguins lose 8-6 to the Hartford Whalers at the Civic Center. 1990: Rookie Darren Turcotte scores three goals for his second NHL hat trick to help the Rangers to a 6-1 win against the Boston Bruins at Madison Square Garden, completing a sweep of the three-game season series. It’s the first time since entering the League in 1926 that the Rangers sweep a season series from Boston. 2001: Mark Messier becomes the fourth player in NHL history to have a 20-goal season at age 40. Messier gets his 20th goal in the first period of the Rangers’ 3-2 loss to the Ottawa Senators at Madison Square Garden. 2006: Sweden edges Finland 3-2 to win the gold medal at the Winter Olympics in Torino, Italy. Defenseman Nicklas Lidstrom scores the winning goal 10 seconds into the third period. Henrik Lundqvist makes 25 saves, including one with his stick on a shot by Olli Jokinen in the final seconds that preserves the win.